The Craftsman Sidewinder has a lay-flat design, for more stable one-person layout work, an automatic blade lock, and a writable surface so that you more easily keep track of your measurements. Craftsman says that the Sidewinder tape measure is the most stable tape on the market. It also has an extending steel hook at the rear, which can hold onto the back edge of a board or workpiece. It has fractional measurement markings. Right now, it’s only available at Ace Hardware. I haven’t made up my mind about fractional markings on tape measures, because I don’t use tapes with fractional markings. I passed along a new tape measure to a general contractor a few months ago, and both he and his son HATE the hard to read fractional markings that clutter up the tape. It’s a little cluttered, but in my opinion so much better. And no, the tape isn’t dual-toned. The source image was a screenshot from the promo video. The top is greyed-out to draw focus on the fractional markings. I’m left wondering about who they’re trying to sell this tape measure to. Well, not, they’re marketing it towards DIYers and I’m guessing gift givers. It has a writable surface, but you still have to keep track of your pencil. If I need to keep track of a measurement but can’t find a scrap of paper, I take a photo with my smartphone or jot it down in a digital note on my phone. No paper or no phone? I write on the workpiece. If I can’t do that, I find something else to write on. Heck, I could write on a cut-off. If need be, I could slice a very thin piece off a scrap 2×4, 1×4, or whatever, and use that for a few carry-with-me measurements. My biggest issue would be finding a pencil, not something to write on. The lay-flat design could be handy. I’ve been frustrated by falling-over tape measures before, and know that’s one of the reasons Milwaukee complemented their premium tape measures with flat-bottomed ones. 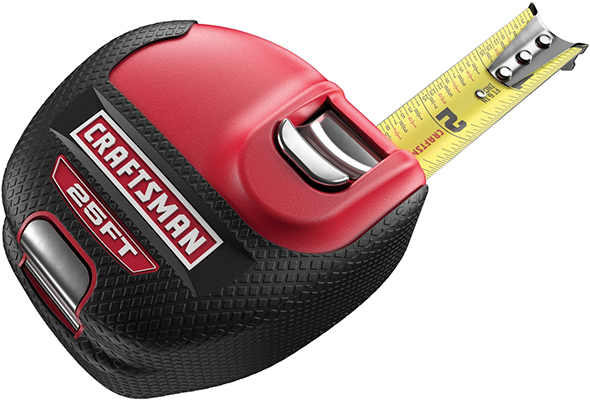 I really like my Craftsman tape measure, which is similar to the “standard” one they compare the Sidewinder to in the promo video. It has one of the best tape measure locks I’ve ever used. I still have mine, and am pretty sure I bought one for my father a few years ago when it was on sale. If so, and he can find it, I’ll have to trade him for it. What’s your take on this? Innovation or gimmick? Math and fractions are hard? 8-1/4″ repeated is hard to do? Take out a piece of paper and lay it out. Did you check my math? I can see the benefit of just having to extend 8-1/4″ for repeated measurements, or similar, but it’s not that much more trouble to jot down measurements on paper and space them out accordingly. And you can still move your tape measure or ruler around. If the measurements were really tough, such as 7-7/16″, I could add up 7-7/16″ eight times, and could lay them out on a sheet or board, but it would be quicker and easier to use a story stick, ruler, or tape measure, and move it along, referencing it off of each last marking. With the Craftsman Sidewinder, measurements are referenced off the edge of the workpiece, with the rear hook extended, but then off of each measurement. But if you’re referencing off each measurement, then what’s the difference between this method and taking the tape along with you? I’d simply move the tape, and then at the end check the measurement to ensure I didn’t compound my errors. The lay-flat design seems convenient, but there’s not a lot of grip, compared to what I would have expected. 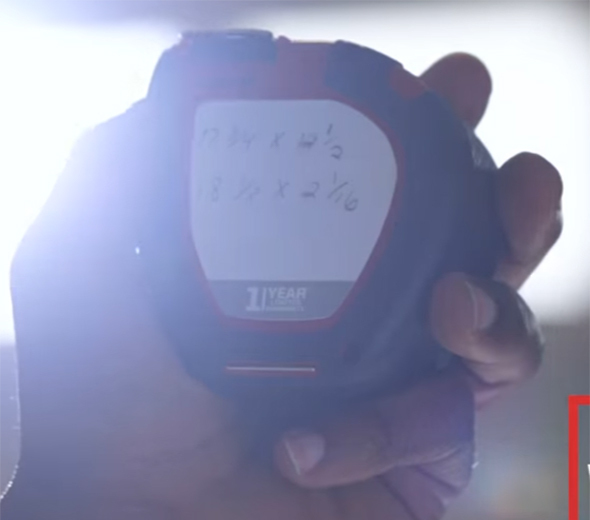 This is the best image of the tape measure’s rear side that I could grab from the promo video, showing the large writable surface. There’s a grippy-looking material around the perimeter, but is it enough to hold the tape in place? This tape has me shaking my head. To be fair, I did not see it in person yet. Maybe its user friendliness is good enough to counterbalance or even overcome my hesitations about the design. This has happened with some tools, where hands-on performance can trump hands-off pre-judgements and assumptions I have made based on product images, descriptions, and my past experiences and opinions. 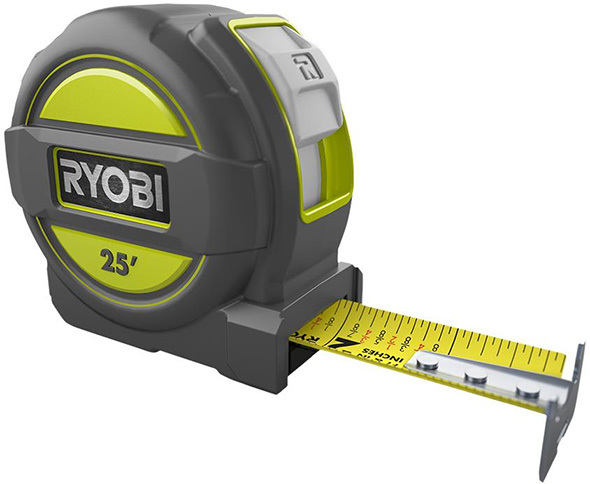 New Ryobi Tape Measure – Where’s the Battery, Laser, or Bluetooth Connectivity? Bagel, the Worlds Smartest Tape Measure, Actually Looks Good, But Not for Daily Users New Empire Level Tape Measures When Did You Learn How to Use a Tape Measure? It looks good for drywall. I can see laying sheets out on stands and this being a useful tool for measurement and cutting. I’m partial to my old metal Craftsman tape measure. Probably from the 80’s. It’s accurate, well built and sturdy/heavy so it doesn’t tip over easy. Which the tipping over part is obviously where this design benefits the most. Gimmicky? Possible. Useful? In certain situations no doubt. It wouldn’t be my every day tape measure unless I was a drywall installer though. I sort of like the fractional things – I would rather they just number the odd or even 1/16th – like you photoshopped. But their markings aren’t bad – it would take a moment or so to get used to but meh. I like the alternating colors – that would help. write on the blade – I’m OK with that in the realm of I have a piece that is actually 13 1/3 inches. HA that’s not a tick mark – but it is now with my handy .07mm mechanical pencil. Provided you can wipe it easily. what I’m highly concerned over – the tape has to make a bend or rather twist to work right. Not sure I like that. give me a normal tape with a flat bottom and rubber pads instead. This is one of those things I look at and can’t really say what I think about it. On the one hand, it does make sense because one thing that frustrates me with lay flat tapes measures is that they tend to tip over if jarred or bumped, and then the tape no longer is laying flat or where you want it. The ‘sideways’ nature of the tape could potentially cure that, as it won’t fall over as it is already laying down. One question I would ask, is the blade itself writable, or just the body of the tape? I have a Fastcap story pole tape, and the ability to mark the tape itself is a great feature in some instances. Writing on the body of the tape is nice but not as helpful IMO. As for where do you find a pencil, it is supposed to be behind your ear, or possibly in the little slot next to your utility knife hanging from your belt. One last thought about the fractional markings. They are clutter to people who use tapes a lot, but if you’ve ever painfully watched an occasional DIYer try to figure out what that little line just past the half inch mark is, you’d understand why they put them there. More than once I was told to cut something 15 5/8 when the actual length was 15 3/4. Until I see one, and mess with it a bit to get a feel for it, I’m stuck between thinking it could be quite useful in some situations, or it could just be a huge gimmick. Keep in mind lay flat tapes in general are not used the same way as a conventional tape measure, so comparing it to a conventional tape isn’t fair. It needs to be compared to other lay flat tapes, which are kind of a niche product themselves. It’s only writable on the back surface. I stand by my comments in the discussion forum…. Probably *ok* for shop use, no way for jobsite. Sidenote….. My go to tape is an only sold at Ace Craftsman, I have about 6 of em. I have a Fastcap tape with fractional measurements listed….. and I love it. I don’t think that I would buy a tape without it. Yes, the math of fractions isn’t hard, but I find myself making little errors without those fractions written out. I think that I still stumble sometimes when trying to read a tape quickly. IMHO, it has some very strong selling points. The price isn’t too bad. I think it will boil down to the quality of the product… if it is a tank and last forever, good deal. But if it has the build quality of a Fiat, $20 is too much. I bought a fastcap fractional tape measure once with the thought that it would speed production, goof proof fraction reading, if you will. It was awful. Like others have mentioned, way too crowded to read. Love my Milwaukee 16 footer. It’s a real tape measure like a 25 footer without the bulk. So many manufacturers seem to think 16 footers are supposed to be toy-sized with crappy tapes. But, the one thing that would be a huge improvement for me is having markings on the back. Laying out can lights proves to be a very frustrating game of keep the tape from flopping. Does anyone have any suggestions for me? A rugged 16 footer with 8-10′ standout and markings on both sides. Oops. I meant love my DeWalt tape measure. I had the Milwaukee and it wouldn’t stay locked- quite annoying. the kobalt 16 foot tape is what you’re lookin for. markings in bottom.. really rugged tape. has a thumb edge and is very light. magnets too. Craftsman’s model the last several years is throw enough stuff at the market and maybe something will stick. This is just another iteration of that model. To me a fractional tape was the equivalent of side wheels when getting used to measuring things ‘the American way’. It looks like the hook would bend easily since it sticks out from the body of the tape. I actually really like the fractions on this tape compared to other tapes with printed fractions. Using red for the major fractions is helpful. It’s innovative since there isn’t another tape like it on the market. Seems gimmicky in practice though. I’ll give craftsman credit for trying something new. I’m not sure whether it’s “better” than traditional tapes. It would take a little getting use to. I would probably get frustrated with the blade not coming out where it “should” be. That hook does retract into the case, so it should not get bent unintentionally. I would throw this in the garage for layout use. Seems a little easier and more flexible than pulling out the t-square. As mentioned though, I can’t see this working well in a carpenter’s tool belt. Really, really, you know the fractions are a plus. Get over yourself. It really comes down to individual preferences. Some people love the idea of fractional calipers, others can’t stand them. Me? I don’t think think it’s something I would ever benefit from. I think it’s a great idea in theory. I just ordered one and will see how it works in the shop. As a general contractor who builds pre-eng steel buildings with lots of metal trims my tape measure, gloves, hands, arms, scraps of tin, etc are covered in measurements. When it’s minus 35 C there is no way in pulling out my phone out of my pockets that’s under my coveralls which is pinch by tool pouch and a fall arrest harness. As for the fractional markings on the tape, round these parts a tape with those on it is called a ‘dummy’ tape. I’m a finish carpenter and i absolutely hate the fractions that are on some tapes they just clutter everything up and i think i speak for a majority of people who often use tapes when i say that they are not needed, we can read 13/16 without the dang numbers cluttering up everything. I use a Stanley fatmax and i put a P-lam scratch pad on it because i often write measurements on the tape. In my line of work i always have a pencil in my belt (or vest) and I’m taking measurements all day. If i have a lot of measurements to make i will do it on something bigger like a notebook but very often i just need two or three numbers and the measure tape scratch pad is one less thing to juggle, I’ve already got it in my hand. The hook on the back looks like it might be useful and wouldn’t get in the way. Having said all of that it’s hard to take anything from that annoying brand seriously. For me the Fatmax is perfect and i wouldn’t want to change the form factor but if that weren’t the case i might be interested to at least try it out except that the tape must be fairly slim and flimsy, some people like that or don’t mind it but i much prefer a wide stiff tape.. Aimed at homeowner DIY. The commercial says it all. It took me a while to realize the lower numbers are for 1/16ths. I was looking around for something like this, but got the DeWalt 25ft 2-pack holiday2016. I like the idea, but the 2-pack was $10 cheaper and double the pleasure with small markings. With a belt clip… and 1″blade.. and very comfortable. It even can do the autolock if you half lock the button. Do I care if the body topples over while I’m measuring long distance? NO. That’s because I’m measuring from the body end, not the blade hook end. As for making notes… I’m sure I can find some cardboard or paper somewhere. Maybe use the app on my phone that says “notes”. I have like 6 erasers in my toolbox. I write notes anywhere. That retract button looks like it might cut someones finger off by mistake… Just sayin..
PS. 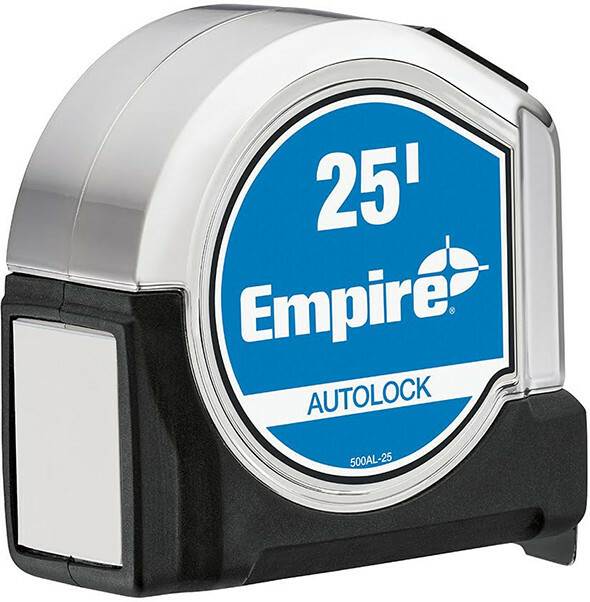 As a HomeownerDIY, I personally HATE measuring tapes that autolock. Certainly a gimmick but while I absolutely abhor Craftsman and Sears, this is a gimmick right in my wheelhouse. I don’t do math very well at all. OK, let me rephrase that … I hate math. And no matter how much I try, I still screw up my fractions. So I’d find that helpful. That this item is only available at Ace leads me to believe it isn’t being marketed toward professional carpenters, tradespeople or craftsmen of any level but instead, one that can be kept in the proverbial junk drawer or the plastic tool box that gets pulled out once every six weeks to cut a couple of 2x4s. I wouldn’t drop $20 on it, but at $10, I would probably keep one in my assortment of tapes. It’s one of my pet peeves that my regular tape measure falls over constantly! I’m just a home DIY-type and to be honest, the rear lock and lay flat design is really appealing. I can take or leave the fractional markings; I doubt that I would care about it in actual use. a handed tape measure? that seems incredibly retrograde. i am left handed. this thing will fit naturally into the right hand but not the left. the video shows it being used with two hands. the advantage of the conventional tape is that it is not handed and it can be used easily by one hand. this is the worser mouse trap. Fractions are for people too stubborn to switch to metric. One thing nobody has mentioned is the ergonomics. Does it feel awkward when trying to pull measurements. Let’s be honest, there’s a good bit of tapes out there that don’t feel good in your hand. Especially the wide blade 25’s or 30’s. They feel like your trying to measure with a softball. Another question is what’s the blade standout? If the blade has no rigidity, its useless if your measuring horizontally on a ladder or on a vertical flat. Completely one dimensional if it can only be used if your work is flat on your table or horses which is probably why it doesn’t have a belt clip. On top of that you have to buy a tape pouch ($5-10) or try to find a pocket in your tool belt to put it. Big Inconvenience. As far as fractional or traditional, to each their own. HD has been selling the C.H Hanson pencil pull for years in the same bay as the tape measures & marking. And yes, craftsman jacked the writing surface from Fastcap, which by the way makes an excellent tape measure. To be fair I’d have to use it to be sure but overall I really like it. Main reason is the non tip feature. As for the fractions, I’m used to using a 1/32″ scale and at times 1/64″ for working on small toys. I was specifically looking for that small increments when bought that scale, so I don’t think the fractions would bother me. I agree a “story stick” would be a better choice for repeated measurements. My concerns are how easy is it to include the base of the tape into the overall measurement. The base looks oval in the back to me. That could cause some problems if you’re not careful. Also wonder how well the tape will last given the bending it goes through to come out of the body flat. For Fathers Day I went to a local Ace hardware store and they had these tape measures for $9.99. My Fat Max tape recently passes the point of no return so for $10 I thought I’d give the Craftsman tape a try. So far I really like it. Two concerns are how long will it last, given the bending of the tape to role it up, and the front tip protrudes below the bottom of the tape so I take care not to damage it. The scales of 1/32″ increments on top of the tape and the 1/-16″ scaling on the bottom works well and to me is not confusing. When I first saw this article I wasn’t sure if this product was a gimmick like so many other Craftsman tools of late, or something useful. I’m sold on the useful part but only time will tell as to the quality. It seems to be well made but we will have to wait to pass that judgement. I do a lot of architectural Millwork, I often need to cleanly layout even hole spacing for a bracket or for grommets.. This tape looks like it would make it easy to do so. The laying flat would also be helpful when measuring from the short end of a miter on something, a lot of times I will lock the blade so the ‘1’ is on the short point of a miter then pull the tape out to measure the other short point. The tape often wants to tip over, this one might help with that. I think I will probably grab one from Sears to give it a shot. At worst it ends up as a solid backup tape measure for the truck. Nope. I bought one of the ‘regular’ Craftsman-branded tapes from Ace on Small Business Saturday two years ago and couldn’t stand it compared to my older USA-made models from back when they actually sold them in Sears stores. I actually find it really weird that Ace sells Craftsman-branded tapes (made by Komelon) but they haven’t been in Sears stores since they did away with the tape measures because they had a warranty and contractors kept getting away with exchanging them for broken tapes even though the tape itself was excluded from the warranty. Seems like now that they are made super cheap and have just a 1 year limited warranty they could bring them back into Sears, no? As for this particular Sidewinder tape, yeah, gimmick. Fractions on a tape. “Difficult math”. Please. As pointed out, this thing has to make the tape twist to have that flat body so there’s just going to be wear and tear on the tape and the mechanisms that force it to twist all the time. This would probably have been a winner for a holiday 2016 gift gimmick, but I guess the manufacturer missed the deadline. I don’t see myself buying this, ever, to use or to gift or even to try out. I do like Komelon’s self-locking tapes though, so I’d rather Craftsman have those, and some lever-locking ones too. The price seems to have dropped by $5 to $15. I have this tape measure and I love it. It’s definitely not a gimmick. I absolutely hate when I’m trying to take a look g measurement and my tape keeps falling over. I also like fractional markings, they’re helpful. The tab on the back is super helpful also. But I did find that the offset isn’t 3 1/2″ like it says on the back, it’s 3 3/8″. As far as being able to write on it, I love that too. Saying that it’s difficult to keep track of your pencil might be an issue for some, but for competent people it isn’t. I’ve never lost track of my pencil for more than just a second or 2. Having a small pad to write on is way better than writing on a cut off or especially than taking a snapshot with your phone. I don’t have my phone on me much of the time because I don’t want to damage my phone. But I agree it would be better to have some type of clip. Some of the above posts mention DIYers… That’s me. Long term at about the Dagwood Bumstead level. I bought one of these, and have played with it for awhile. I ALWAYS work alone, and what attracted me to this thing was the frustration I can have at marking things out, and the tape tips over and twists or comes unhooked, etc, and then it comes unlocked when I try to straighten things out. It never reduced me to an emotional heap like a kinked garden hose in a TV ad, but it could be annoying. The laying flat and automatic lock are the whole thing for me. I’ll never use the writable surface, and most likely never use the rear hook. My first impression? It’s kinda big. Fits the hand well though. VERY nice for laying out measurements on the broad side of a board or panel… Hook it, pull it out, and there you go. Press the button and it retracts. That’s what I want it for, and I’m glad I bought it. If I hadn’t read the above discussion, I wouldn’t have noticed all the numbers on the tape. Yeah, it’s kinda busy, but it’s clearly marked, and if I ignore all those fractional numbers, they can’t hurt me. I’d expect the added complexity of the tool means there’s more to go wrong. It’ll probably fail sooner than a simpler one. Dragging it through dirt will probably gum it up faster. If this were the ONLY tape I could have, I’d stick with my old Stanley. 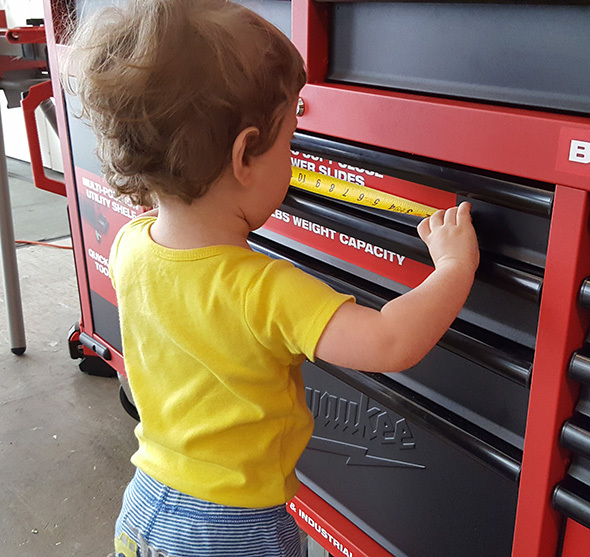 I’ll still grab one of those for measuring pipe, figuring out how much Romex I need, working on a ladder, or if my wife wants to measure furniture. Final verdict? This is a specialized tool for measuring out on the broad side of a board or a panel, and it’s VERY good for that. I’m going to use it a lot down in the shop, and for the occasional outdoor woodworking job. I might even buy another just in case this thing dies young, and they don’t sell enough to keep making ’em. I like it. I agree. This is a bench top layout tape measure. It’s not for carpentry. It’s fantastic for laying out measurements on my work bench, way better than a normal tape measure. I’ll never use it building a house or the like. Haven’t seen it in the stores yet, but I would guess that it would show up eventually if they’re selling it online. Maybe the other Craftsman-branded tapes will make their way into Sears as well? Complete gimmick. Good luck spanning this tape far enough out to hook a balloon wall and Mark a layout from the top plate of a wall 10 feet away. I see absolutely no application that this sidewind gimmick would be better then my tape. If you need a cheat sheet that clutters up your tape to be able to read simple no brainer tape measure fractions, you should probably just put it down and hire someone. 25′ STANLEY FATMAX FOR LIFE! Shouldn’t your pencil be right on top of your ear?